The Eclipse Safari mobile app from Simulation Curriculum is one of many mobile tools you can use to make the most of the Aug. 21 total solar eclipse. Eclipse day is almost here! On Aug. 21, a total solar eclipse will sweep coast to coast across the United States. To help you make the most of your experience, consider packing an eclipse app in your pocket. Below are seven such apps, which can provide you with information about when the eclipse will take place in your location, scientific information about the eclipse, and even audible announcements about when to put on and take off solar glasses. And if clouds obscure your view of the big event, you can watch NASA's live stream on most of these apps. We must admit we're a bit biased when it comes to this app, because it features a section of up-to-date eclipse articles from Space.com, as well the Space.com Twitter account. And that's just the start: Eclipse-goers will delight in the number of features offered in this free app, including a countdown timer, an interactive eclipse map (for any location on Earth), a shadow tracker, an eclipse simulator and even a live stream on eclipse day. This app comes from Simulation Curriculum, the company behind the mobile astronomy app SkySafari. The NASA-sponsored Global Learning and Observations to Benefit the Environment (GLOBE) program is asking citizen scientists to submit their eclipse observations through this app. You can contribute observations of the total solar eclipse or partial solar eclipse. Data collected from the app will contribute to real NASA science. You can learn more about the app here. Users can continue using the GLOBE Observer app after the total solar eclipse is over. The app can also be used to submit observational data of Earth’s cloud cover (which is then compared to NASA satellite observations) and the location of mosquito habitats (to reduce the threat of misquito-borne disease). 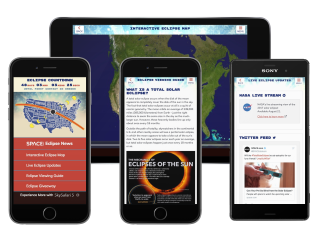 We love this free app not only for its eclipse features, but also because it brings the latest Smithsonian Astrophysical Observatory news to your pocket. Other features include a connection to NASA's live stream of the eclipse, an interactive eclipse map to tell you when the eclipse will occur in your location, and lots of science content such as views of the sun from space and a virtual view inside an eclipse simulator. The total solar eclipse mobile app from the Exploratorium science museum is one of the mobile tools that can help you on eclipse day. In this free app from the Exploratorium science museum in San Francisco, both science and content are key. The app features a mind-blowing five live streams of the eclipse, including one with an orchestral arrangement happening at the Exploratorium. Other features include both Spanish- and English-language discussions about the eclipse, as well as a live view of the eclipse from Wyoming and Oregon. Also bundled in there are science facts about total solar eclipses, and how to view the event safely. If you want a free "just the facts" approach to the eclipse, this app has you covered. It focuses on the essentials to get you looking at the sky at the right place and the right time, providing a map of the eclipse, a countdown to when it happens, animations of its path and some general information to help you with your view. Another (mostly) free, but fully functional eclipse app is the one made by the people behind the Eclipse2017 website. The app's makers promise that "no astronomy degree is required" to understand the information. It focuses on the two basic things every person needs to know about the eclipse: where the total eclipse will be visible and what time will it happen depending on where you are. The free version has no ads, but if you'd like the app to use your GPS to help you on eclipse day, you'll need to pay for an upgrade. This interesting and free app, made by a person who has observed many total solar eclipses, offers several features: audible voice countdowns to the "contact" times (points during the moon's progress across the face of the sun), announcements about interesting things to look for (such as lighting changes or drops in temperature) and even when it's safe to take your solar glasses off. If this sounds complicated, no fear — there's a demo mode to let you practice ahead of time. This app is perfect for anyone planning to photograph the eclipse or observe it with a telescope, because the app alleviates the need for you to remember things like when to take off your camera's or telescope's solar filters. Just like the Exploratorium app, this free app was created by a group of professional science educators. It includes all the basics, such as information about what you'll see at your current location, the nearest spot where totality will be visible (if you're not currently inside the path), plus basic information about how, why and when eclipses occur. This app might be ideal for teachers and educators, as it also features activities for families and schools.